Are you in a place you didn’t expect to find yourself in? Are you facing circumstances you wish you didn’t have to experience? These promises are for you too! When we focus on these promises, they will anchor our emotions, keeping us from fear, panic, nervousness, and bewilderment. When we don’t understand what is going on, these promises will bring us certainty, clarity and hope. As life zigs and zags with all its twists and turns, we can be content and at peace. My dear friend, when you ask, What is happening right now? 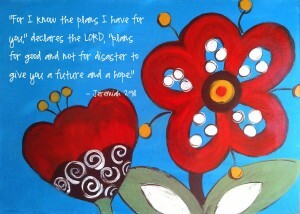 God is saying to you through Jeremiah 29:11, “Oh, I have a plan! All will be well!! Have a grace full week focusing on God’s promises! “Are you in a place you didn’t expect to find yourself in?” Ha!! You always make me smile! I’m praising God with you and standing in the gap for you in prayer as God unveils His totally new plan for you and your family! Every time I read this verse I am in a different place in life, yet it draws me in and reminds me that HE is in control of ALL things no matter what situation I find myself in. Probably should study this verse every day! I love your comments. It reminds me over and over that there is something that His Word can teach us no matter how familiar the verse is. It is always fresh and new for our current need. Thanks for commenting and joining me at Grace Full Journey!